My darling hates a bath so much he will jump out of a tub. I usually end up with more water on me than he does. I have found that getting in the bath with him (in a swimsuit) helps ease his anxiety. What things have you tried to make bath time more pleasant? Last edited by Dave|Xoxide; 01-20-2008 at 12:57 PM. I just gave my pups a shower last night as well. I used to wash them both at the same time when they were tiny puppies but now that they are bigger and taller, I had to do it one at a time. I have to lure both them to get into the tub (I close the tub door as soon as they get in.) I have no problems giving them a bath. So far I have bathed Abby in the tub but I was outside staying dry. We both needed a shower so we both took one. Last night my 12 year old really needed a shower and the pup was muddy from the rain so he gave the pup a shower. I say whatever works! Snoopy is the same as tipsy. So I just lay some towels out around the tub so that he doesn't get water on the floor. He just puts his paws on the side of the tub but he doesn't try to walk out. After the first couple of minutes he just stands there and takes it. He gives me the puppy eyes to try and make him feel bad for him. Try a hand held shower attachment with out putting water in the bottom of the tub. wet to the skin, soap and lather, rinse. My mom's Shih-tzu/lhasa apso does the same thing as well. It must be a shih-tzu thing! Tipsy also does this thing where he will bear hug my arm when I am trying to rinse him. It actually makes it easier for me. I am lucky to live where there is a self-service dog wash in my area. The tubs are waist level, with steps available if the dog is too big to lift. All of the tubs are disinfected between dogs. They supply waterproof aprons for the owners, and they have places to secure the grooming collar (supplied by them) to the back of the tub so that the dogs don't jump out. There are about 8 different types of shampoos available depending on skin type and what your dog needs. All of the tools are available, including undercoat rakes, slickers, combs, etc. for use. The sprayer is like the ones they use in restaurant kitchen, with a controlled 85 degree temperature. There are super absorbent chamois towels available for pre-drying the dog, then the dryer hoses come out of the wall but the motors are in the basement so that they don't make noise. The air is a controlled likewarm temperature. There are lots of different nozzles so that you can choose what strength of air to use. There are ear, eye, and tooth wipes available also. There are also about 5 or 6 different scents of grooming sprays available. If you need the toenails clipped, it is $5.00 extra. I take Ruby there at least once a month. The prices go by the size of the dog. My Susie was 35 pounds and it only cost $12.00, but Ruby is a large dog (80 lbs), so she costs $14.00. The cost of the warm water, shampoo, warm air for drying, laundering towels, not having to bend over the tub, not to mention the mess and hair all over my bathroom and tub, makes it more than worth it for me to take her there! A bargain, as far as I'm concerned. They have a punch card so that every 8th wash is free. They also sell treats and dog grooming products, and Ruby always gets a treat when she leaves because she's getting better and better at putting up with the dryer every time. One of the many advantages of having a small dog, you don't have to leash your dog to the soap holder thingy like I do. Jak isn't a huge fan of baths but he tolerates it. My new trick is to fill a Kong with peanut butter and put that in my left hand while my right hand is doing the washing. That way I can keep him still, and he doesn't try to jump out. This is what I have and I must say i'll never give a bath with a cup ever again! I put him in the shower and attach the hose and he walks in circles, but he gets clean. He wont stay in a bathtub. He jumps out of and on everything so out of the tub is no big deal. I think the attachment was 20 bucks and well worth it! My dogs don't necessarily 'like' baths, but I can put them anywhere and ask them to "stay" and they will do so; they had to have treats in the beginning (for positive reinforcement...bath means treats "YAY"!!! )...sometimes just having obedience skills down really well can help. I have a Border Mix, and a Corgi mix...so not 'small' dogs; I have enjoyed being able to actually groom them regulary at the place I groom at, but now that I am moving, I will have to find a grooming shop to self bathe them...till then, they will have to go back to a regular ol' tub...Lol! 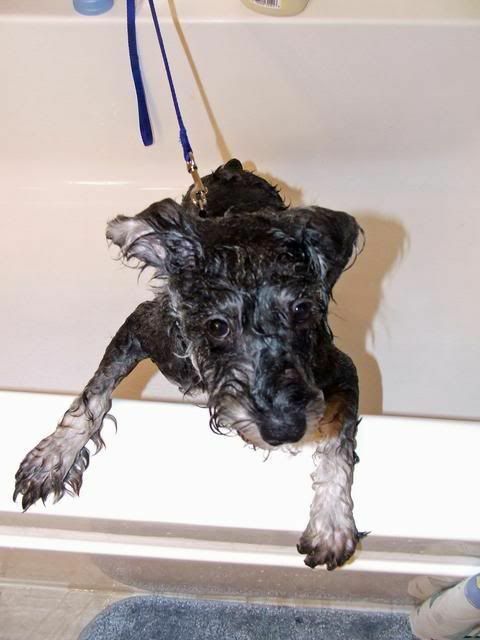 My dogs enjoy their bath, so there isn't an issue (good thing with two Standard Poodles)! I started Maddy at 9 wks. old, by taking her into the shower with me. She loved it so much, that I had to close and lock the bathroom door to keep her out - otherwise she'd have jumped into the tub with me! 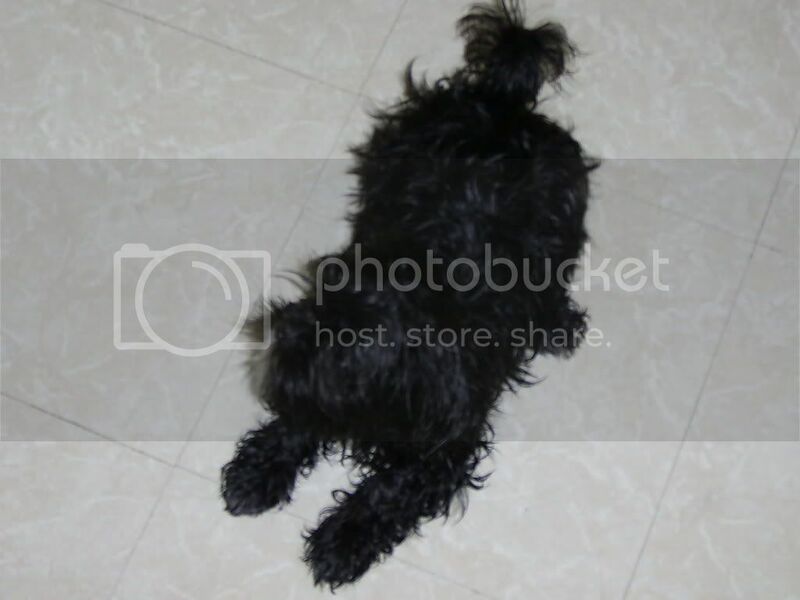 LOL The Shih Tzu is easier to do in the kitchen sink. Luc didn't like getting a bath at first, but, he's ok with it now, and has learned to not fight it. I have a power sprayer I hook up to the shower, which gives a good massage, part of the reason they enjoy the process, I'm sure! I sit on the "throne" while I wet them down, and then use a spray bottle with shampoo mixed w/water, massage it in, then rinse. I turn on the HV dryer while they're still in the tub, so they don't drip water all over. Then it's onto the grooming table to get fluffed and brushed. Now the bath is all done. 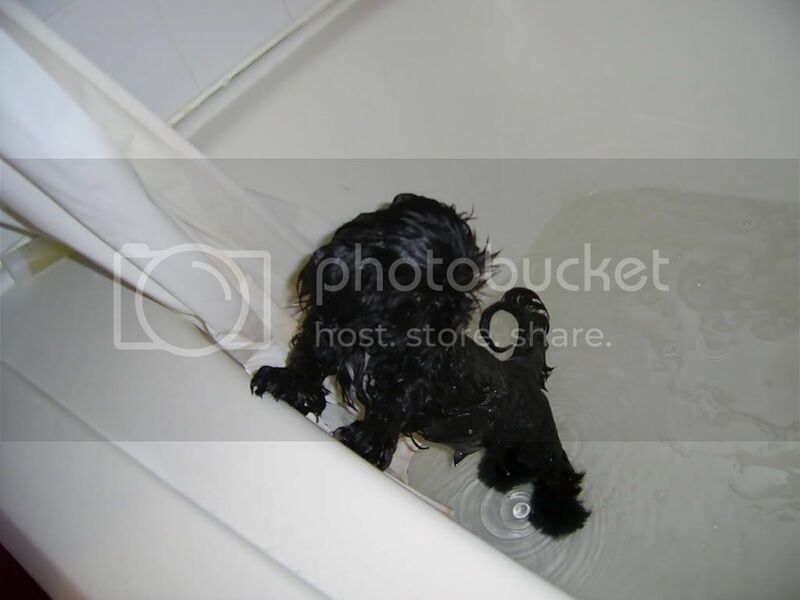 All those bath pics are so cute! I have a big dog that loves well likes baths.I use a shower spray and I don't fill the tub. he just lays there. Sometimes i stand in the tub to wash him cuz my back kills me leaning over the tub. But I was going to say if your dog is that small would he fit in the kitchen sink? then you could be right there face to face with him and just use the sprayer. I used to bath my nephew in the kitchen sink and my grandma used to bath us in one and we loved it-haha. My two dont like bathes, but will tolerate them. We have taught them "get it", which is much easier with a Great Dane and German Shepherd. Then I say "stay" and they do. Another useful command is "stand". I cant imagine having to fight with these two at bath time. The Dane gives his sad face and hangs his head, but is still well behaved. It figures, the day after I took Ruby to the dogwash, we had above freezing weather for three days in a row, and most of the snow turned to salty slush. Even with her jacket on, her paws and underside need tobe rinsed off whenever we come in from a walk. I wish they made MUDFLAPS for dogs! The shower attachment is what was scaring our dog, so now we fill the tub up with about 4-5" of water, and use a large cup to spoon water over him. Before and after the lather. I have to get in with him too to help calm him down. Also, a soft suctioncup-backed floormate in the tub made things much easier for him too. Oh. My. Goodness. 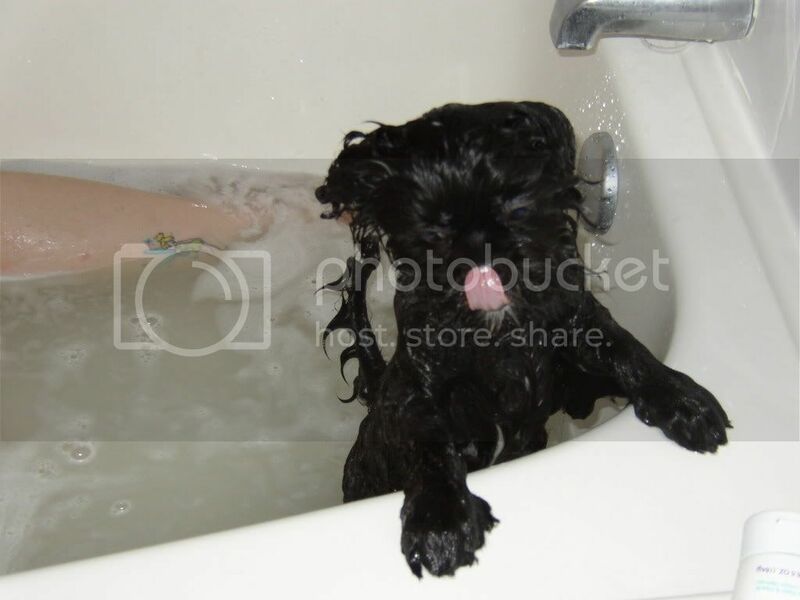 Bath pictures-so cute! I must admit, I like giving Snickers a bath a little more than I should because I can't help but laugh at how funny she looks with her fur all wet and ruffled. I second the kitchen sink idea. That's where I do my doggie bathing. The spray attachment makes life so much easier and I don't have to bend down or anything, which gives me more control on keeping her calm/not letting her escape. I have showered with Zeke more times than I care to count. And he's not even my dog. Now that I am grooming again, I am spoiled, and able to groom my dogs at the shop I groom at...Lol!!! My kitties usually still get bathed at home, though, and that is usually a "trip" hahaha! 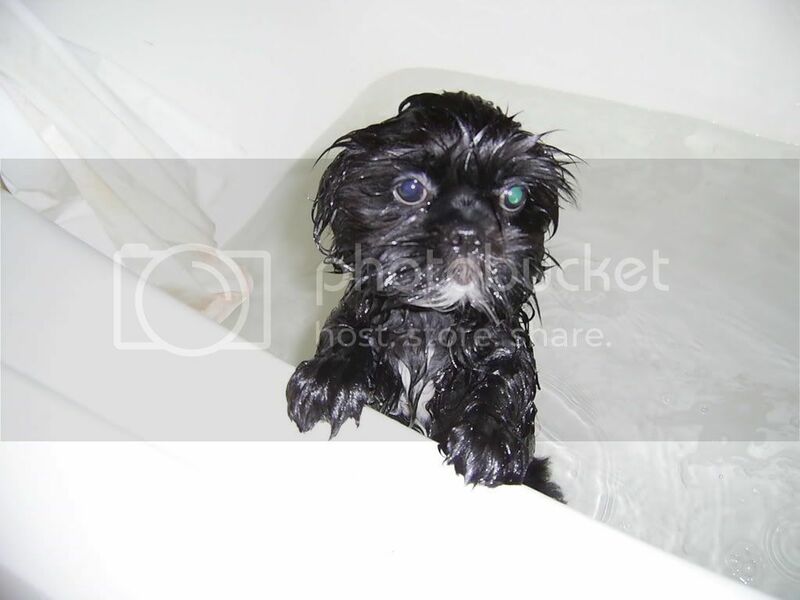 I had the DH put a hand-held shower-thingy on one of the set tubs downstairs and Gus (the Shih Tzu) gets bathed there. Our big dog Jack is impossible in the tub, so in winter he goes to a local groomer. In summer I just leash him up outside and bathe him on the patio. He deals.